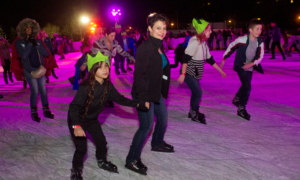 (Cherry Hill, NJ) – The holidays may be over, but the Camden County WinterFest Ice Rink will continue to help Camden County residents slide into the New Year by remaining open throughout the months of January and February. For the next two months, the WinterFest Ice Rink will remain open to skaters during its standard operating hours: Thursdays from 5 p.m. to 9 p.m.; Fridays from 5 p.m. to 10 p.m.; Saturdays from 12 p.m. to 10 p.m.; and Sundays from 12 p.m. to 9 p.m.
Additionally, the Ice Rink will host a number of recurring promotions and activities throughout the remainder of the season. Saturdays (9 a.m. to 12 p.m.): The Jersey Pinelands Curling Club will host curling matches from 9 a.m. to 11 a.m., during which the rink is closed to the public. The JPCC will then host introduction-to-curling opportunities for the general public from 11 a.m. to 12 p.m. In each one-hour session, JPCC volunteers will give approximately 20 people brief lessons on basic curling skills that allows them to play a 30-minute game. Saturdays (12 p.m. to 2 p.m.): Attendees will receive one free admission ticket when they purchase one admission ticket at full price. Sundays (11 a.m. to 12 p.m.): WinterFest will hold skating lessons for people of all ages and skill levels. Lessons are taught by our professional skating instructor, Jacqueline Barr. Our skating sessions and fees include: 30-minute lesson with our instructor, followed by 30 minutes of practice and skate rental for a total of one hour on the ice each week. Sundays (12 p.m. to 9 p.m.): Sundays are family days at WinterFest! Guests who buy three admission tickets get one free all day.